The concept of time, slippery and peripatetic, has long been a favourite indulgence of artists, theoreticians and writers. Although philosophical doctrines have been penned, sculptures erected, and books of poems published in years past, the topic remains evasive, especially in light of recent technological innovations that often disorient and streamline our circadian habits. Our experience of time is highly personal, customised, even. Yet a macro-level consideration of how our collectively shared experience of daily time has changed in the recent past reveals a quickening of pace, the result, perhaps, of increasing integration of technology with the everyday, accompanied in some instances by a reactionary appreciation for the slow, skilled and considered. What can be gleaned today from the accrued and fractured accounts of time, the quickening and lessening of pace as felt through the works of an artist? Consider Andy Warhol’s Time Capsules project, an archive of the artist’s everyday accruals from 1974 to his death in 1987. A set of 612 dated cardboard boxes containing banalities ranging from daily newspapers, correspondence, and financial records to gifts and refuse, Warhol’s Time Capsules reimagine the impetus of the first time capsule realised in 1939 by Westinghouse Corporation for New York’s World Fair. As per the popular understanding of the time capsule, the Westinghouse version combined and preserved items considered emblematic of their historical moment: microfilaments, bank notes, recorded messages from Albert Einstein, commonly used textiles, etc somewhat perversely, the boxes containing Warhol’s cast offs have since been lovingly catalogued, preserved and photographed by museum archivists. Yet Warhol presciently understood that it was the near-invisible matter most familiar to us that may most distinctly define a given historical moment, perhaps more so than whatever is ceremoniously deemed significant at the time. Warhol’s nonchalantly collected materials accumulate significance and authority through their maturation, acting as a glimpse into its historical moment. While Warhol’s Time Capsules simply exist in two temporalities (the dates on which Warhol archived his accumulations, and the moment in which they are activated by the viewer), it was his intention to create tension between his temporality and a projected future moment of activation that renders the work prescient. An oppositional model to Warhol’s auguring one, meanwhile, would be that of fashion: an artist who has little regard for the future activation of her artwork, which consequently becomes diminished conceptually in time. Although such work may exist fruitfully in its given moment, the lack of consideration of its future activation will result in that work remembered solely relevant to its specific historical moment, and thus anachronistic. One could understand Julian Schnabel’s oeuvre as such: while the artist acts as a figurehead to the bigness of the 1980s, his work has since been reduced to emblematising this period. Working primarily through video and film-based photography, Moyra Davey contemplates the crawl of time twofold: first by tracking the frustrating accumulations particular to the domestic—dust, paper piles, empty gin bottles—and, secondly, by indexing the extinction of the late 20th century technology. Davey’s straightforward photographs forlornly document shelves of dusty books, vinyl records, Manhattan newsstands, and radios as an emotional consideration of objects and the slowness, and authority that they represent. Indexed here is the waning societal moment in which objects related to an impassioned amateur or critical hobbyist were found through sifting, browsing, luck and skill, but have since been replaced by programmatic search. No longer must we dig through record store bins to find a rare album—such an experience has become a streamlined digital interface. Davey’s photographs are intimately scaled and shot on film, pointing to a further implicit challenge to the current status quo of digital imaging technology. A similar celebration of skill-based media and predilection for indexing moments of the recent past can be seen in the work of Glasgow-based artist Alan Michael. A hyperrealist painter, Michael’s oversize canvases pictorialise oft-figureless and seemingly banal scenes with a virtuoso expertise. His paintings evidence specific, recent instances depicting the confluence of corporate and cultural branding and the design of one’s identity—in short, the paradoxical attempt to aestheticise and brand individualism to masses of people only visible to them after the passage of time. 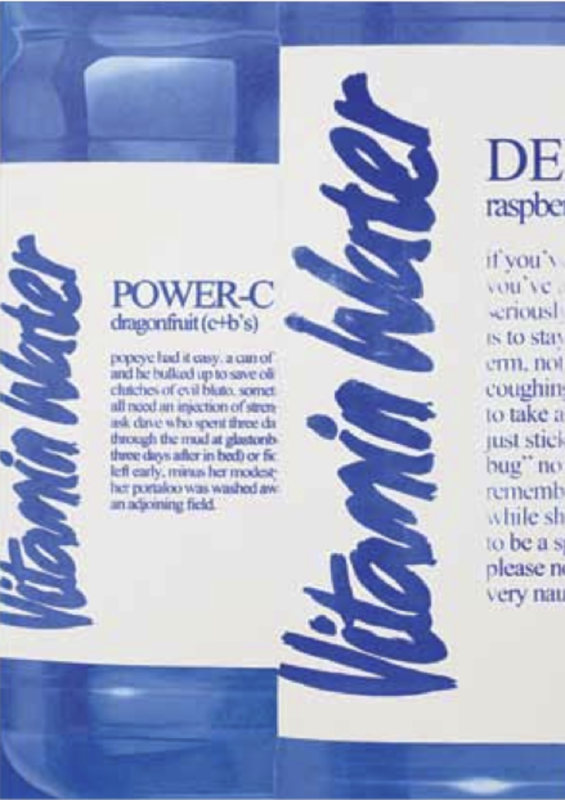 A number of his Mood series, 2010, depict rows of Vitamin water bottles in a worthy Comic sans-esque font while another renders a slightly out-of-focus ban button writ upon with 1960s style psychedelic lettering. 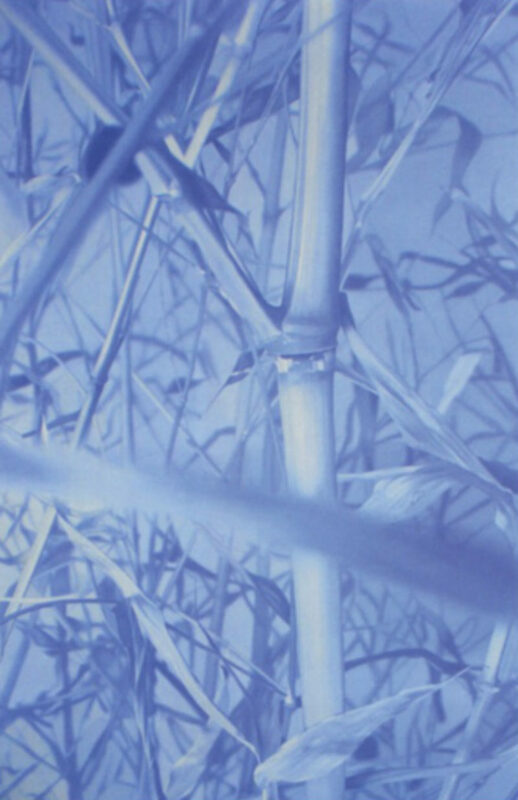 The bamboo plant depicted in Mood 9, 2010, once a part of savvy interior décor in the 1990s, now seems hopelessly taboo. While Davey and Michaels’ work may be made contemporaneously, both artists cite the expiration of previous historical moments to understand the fleeting nature of our current one. If these artists gesture toward the reordering of the present by illustrating the waning of moments passed, new media artist Cory Arcangel forecasts the impending obsolescence of the present moment specifically through the lens of technology. His series of Photoshopped gradient prints pre-empt their own expiry by maximising the printing technology available at their creation. Arcangel predicts that, due to the rapid advancement of imaging technology, the prints will quickly look outdated, thereby exposing the limitations characteristic to the technology of that year. The titles of Arcangel’s gradient prints act as instructions for work’s digital creation, ‘Photoshop Cs: 84 by 66 inches, 300 DPi, RGB, square pixels, default gradient “Blue, Red, Yellow”, mousedown y=18200 x=1350, mouseup y=23400 x=18250’, 2010, positioning the series as digital readymades a viewer may create themselves. Moreover, one could argue that the aesthetic deskilling found in Arcangel’s gradients reflects a similar tendency within society at large. Arcangel, though not technically a ‘digital native’ himself, points towards a younger generation’s proclivity for the immediacy of information access. Whether the artist sees these advents as positive remains to be seen. In contrast to nascent technology belatedly harnessed by Arcangel, Matthew Monahan’s figure-based works incorporate elements of aestheticised museological display, though one would be mistaken if they were to assume the artist was impassioned about the politics of institutional critique. Working with sculpture and drawing, Monahan collapses both time and space by combining disparate aesthetics characteristic of periods and places ranging from Lascaux to ancient Egypt as well as Greek and Roman antiquity. In the artist’s oeuvre, a centuries-old Olmec-like face from Tabasco is curiously at home cast in bronze perched upon a British suit of armour and a slick, contemporary fibreglass plinth. That his beautiful, ancestral-looking figures morph through various eras and locales feels not strange or forced, but akin to walking through the Metropolitan Museum’s various wings. Yet Monahan’s pastiches are not merely postmodern puzzles: we are not meant to partake in an art historical name game. In fact, perhaps we are meant to consider why we don’t feel prompted to think about a work’s specific author, and what has happened through time to made these eras and aesthetics collapse into one another. Instead of using aesthetic referents to conjure specific works with authorial presence, the artist implodes and ruptures time: his figures gesture toward the fractured, peripatetic consciousness emblematic of our shared contemporary experience. While the experience of such technological and societal progress has been approached variably with fetishism or knee-jerk condemnation, artists such as Michael, Davey, Monahan and Arcangel highlight the necessity to consider whether a new consciousness is summoned by the extensive integration of contemporary information culture into daily living. As artists and writers, a most critical and radical moment takes place when we give ourselves time to suspend ideas before their inevitable evolution and departure into the slipstream of constantly accelerated culture.